Hand dug wells and other manual methods to dig a well have been in existence for thousands of years. 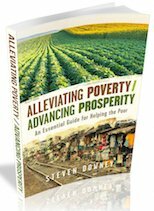 Though mechanized methods are more efficient and effective, there are often no options for people and communities in need of water. People have been making wells without the use of power equipment for thousands of years. Each of the methods described in this section involve hard work, but most can be carried out using locally-available materials and skills. 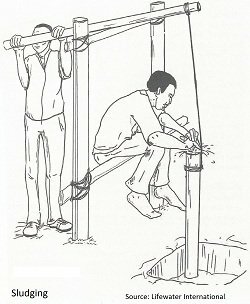 Digging a well by hand, using simple tools like a pick and shovel, with a bucket on a rope to remove cuttings, is the oldest and probably the most frequently-used method of getting access to groundwater. Making hand dug wells requires only common tools and skills, so it can be done by anyone. In many areas men have specialized in this trade as a business. Where labor costs are low, this is usually the least costly method of well construction. In an aquifer with low permeability, a large diameter hand dug wells may produce more water than a borehole in the same aquifer. Hand digging a well is very dangerous due to the high potential for cave-ins and lack of oxygen. Digging a well is very hard work for one person. Because it is difficult to dig very deep, hand-dug wells more than 30 meters are uncommon. Unless the groundwater seeps in very slowly, it is not possible to dig more than about a meter below the water table. Digging into rock is extremely slow. A hand dug well is very difficult to protect from contamination. There are many ways for surface water to seep in, and the typical bucket on a rope used to fetch water easily transmits bacteria to the groundwater. A hand dug well can be protected by sealing the walls, pouring a concrete apron, putting a lid over the top, and installing a hand pump. But these measures increase the cost of the well. 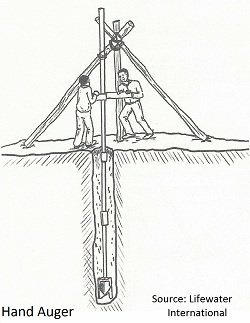 This ancient drilling method consists of raising and lowering an open pipe in a water filled hole. During the up stroke, the operator holds his hand over the top of the pipe. Just as the pipe reaches the top of the stroke and is starting down, the operator uncovers the pipe. As the pipe is rapidly pushed down, water and cuttings are forced out the top. The pipe can be as simple as hollowed-out bamboo or joints of PVC pipe with a sharpened bit at the end. With a suitable drilling pipe, a borehole can be advanced to at least 70 meters. 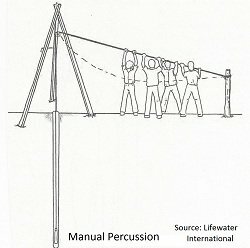 Beyond about 10 meters, it is necessary to raise the pipe using a rope and a tripod. Sludging is much easier and safer than making a hand dug well. The materials required are very simple and can be adapted from whatever is locally available. Sludging is very tiring and requires a crew of people taking turns. It can only drill in soft materials such as silt and sand. Hard clay can be slowly penetrated but rock can't be drilled. Large gravel can't be lifted out of the borehole. The borehole diameter is typically only slightly larger than the diameter of the well casing, so it is hard to install an adequate sanitary seal to prevent contamination from surface water. This form of drilling is said to have been used by the Chinese more than 4,000 years ago. It is still commonly practiced around the world today. It consists of repeatedly dropping a heavy drill bit connected to a rope or cable in a hole partially filled with water. The bit loosens the soil, or chips off pieces of rock. Once enough cuttings have collected in the hole, the bit is pulled out and a bailer is lowered to collect the cuttings. The bailer is a pipe with a one-way valve or flap at the bottom that lets cuttings into the pipe but not out. When brought to the surface, the bailer is tipped up to empty the cuttings. 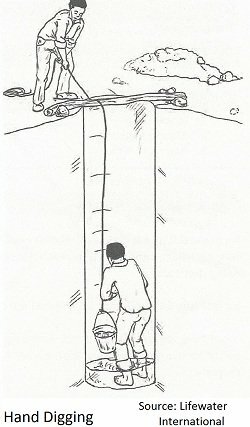 There are many different ways to raise and lower the drill bit and bailer, such as pulling on a rope or using a flexible pole called a "spring pole"
By adding a sharpened bit and a one-way valve at the bottom of the drill pipe, manual percussion and sledging techniques can be combined to get better penetration than sludging and more efficient cuttings removal than percussion drilling, while being safer than making a hand dug well. Although manual percussion drilling requires more specialized tools and more skill than making a hand dug well, it is a method that anyone can employ and perfect. It is faster and much safer than making a hand dug well and is capable of reaching 70 meters or deeper. With a proper bit design, percussion drilling can also penetrate boulders or solid rock (very slowly). The borehole can be sealed to prevent surface water from entering the well and with a hand pump installed can provide a good supply of safe water; another advantage over a hand dug well. Starting the borehole usually requires digging a small-diameter starter hole more than a meter deep. Lifting the drill bit and bailer is hard, but a group of people can pull together to share the work. Also called a ''sand point'', this method employs a sharpened hard steel point at the end of a short (less than 1 meter) section of perforated pipe. A strong steel pipe is screwed onto the drive point and the assembly is driven into the ground using a heavy sledge hammer. This is a very simple, one-man operation that can install a shallow well in only a few hours. A drive point is only effective in loose sand where there is a high water table, such as close to a river or lake. It is very difficult to drive more than about 5 meters. It is not possible to install an adequate sanitary seal so a well made with this method is easily contaminated. 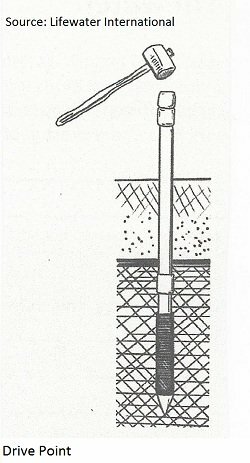 This manual drilling method uses a small-diameter open-bottom bucket with angled teeth at the end to cut into the soil. The bucket is attached by a series of steel rods to a T-shaped handle at the top by which the bucket is rotated. As the bucket fills, it is lifted out and emptied. Additional rods are added as the hole gets deeper. Auguring is normally used for taking soil samples, but is has been marketed for use in shallow well construction. Return to "Groundwater" from "Hand Dug Wells"